Remember back in February when ESPN dropped a bombshell report alleging Arizona head coach Sean Miller was caught (via FBI wiretap) discussing a $100,000 payment to star big man Deandre Ayton? 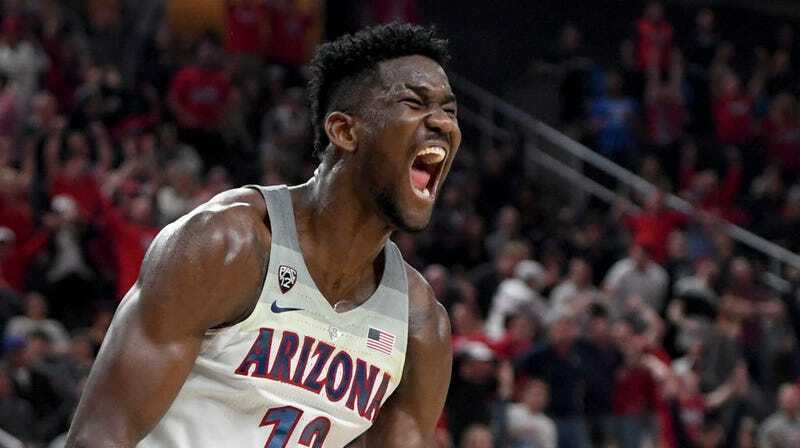 The college basketball world flipped upside down right in the heat of postseason play, yet Ayton was allowed to continue playing and Miller sat out just one game. From there, we didn’t hear another word about the Arizona scandal. Ayton put his name in the NBA Draft and went on his merry way, while Miller returned to the sidelines to coach. Today, a bit more information was released on Ayton’s shady recruitment, as one former Adidas consultant testified under oath to paying the former Arizona star and his family. TJ Gassnola, a former AAU director and Adidas consultant, included Ayton in a list of five total players he provided money to on behalf of the shoe company. The others? Former NC State guard Dennis Smith Jr., current Kansas forward Silvio De Sousa, former Jayhawk guard Billy Preston, and the star of the show, former Louisville signee Brian Bowen Jr.
Also included in Gassnola’s testimony? He met with Kansas coach Bill Self and recruiting targets, and “assured” them he was there to help. Gassnola did not mention specific dollar amounts for any of the players, but he is expected to continue to testify on Thursday. The former Adidas consultant plead guilty to conspiracy to commit wire fraud back in March, agreeing to become a government witness in hopes of avoiding a max of 20 years in jail and a $250,000 fine. Obviously Arizona is a Nike school, so this does not implicate the Wildcat basketball program specifically. That being said, Gassnola’s testimony could lead to Ayton being declared ineligible, meaning Arizona would have to vacate all 27 victories the 7-footer participated in. As for Kansas, North Carolina State, and Louisville, all Adidas schools? Now that’s a different story. What was vitales big news anyway?